If you're looking for a unique, cute and handmade hare to give to your little honey bunny this Easter, the options are multiplying like rabbits at Etsy. They've got eco-bunnies galore just waiting to hop right into your child's Easter basket. 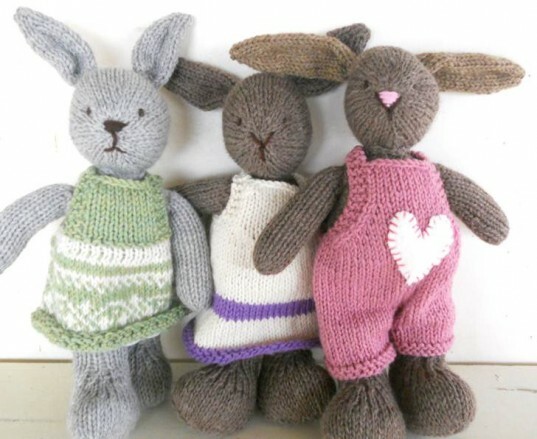 Take for instance, these sweet Waldorf minded knit bunnies shown above. 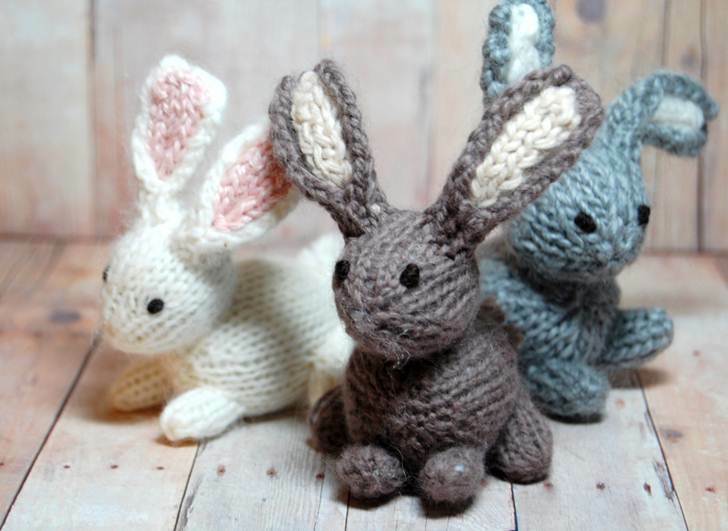 Each of these adorable little rabbits is soft, cuddly and hand-knit with a luxury 50% merino/50% angora fiber. Bunnies are stuffed with eco-friendly stuffing (or cleaned and carded locally-sourced wool, per request). These little friends will inspire imaginative play year-round, and they can be custom made in any fiber or color combination. Each bunny arrives beautifully wrapped in tissue paper and tied with ribbon. Also take a look at this shop's adorable bunny and carrot set. And read on for a bounty of bunny gifts! This cute bunny is custom knit for your child in the colors and clothes of your choice. Heirloom quality, this bunny is made from a wonderful soft wool yarn and stands about 14″ (36cm) tall, to the tips of their big bunny ears. They have a sweet little tail, and are stuffed with wool stuffing. Bunny faces are safely and simply embroidered with wool. You can choose for your bunny to be wearing overalls or a dress, sweater, or other clothes. You can keep this bunny toy clean in the sink — just swish with a little gentle soap, rinse well, squeeze out excess water, and air dry. Woolies also has a great Soft Bunny Rabbit Doll for babies. We love Fairyfolk creations for their unique sweetness and quality, and this little bunny perched on her spring nest is no exception. This Waldorf inspired rabbit has two big bunny ears, a little pink nose and a fluffy little tail. 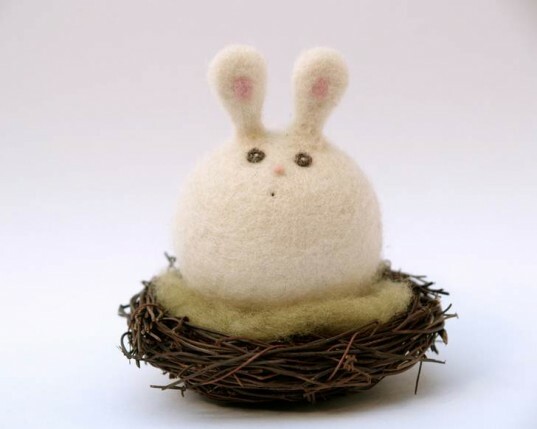 She’s needle felted with 100% wool and her vine made nest is lined with comfy soft mossy wool. This play set will bring hours of fun to your child’s world at Easter, and year-round. This beautiful organic rabbit stuffed animal toy is basic but lovely and is from one of our favorite Etsy shops to boot. The perfect little plush stuffie for your modern kiddo. 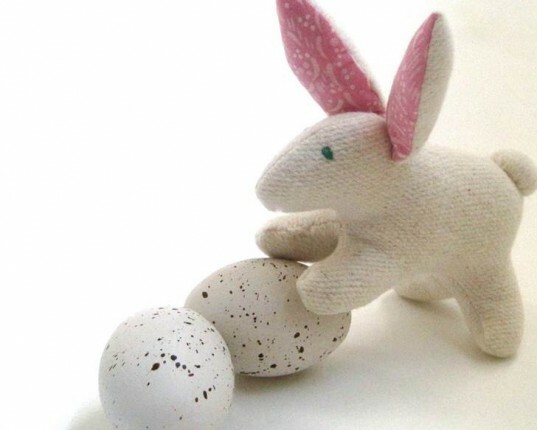 This organic rabbit measures 5″/13cm long from nose to tail and is handcrafted with soft 100% organic creamy white cotton fleece then stuffed with pure wool stuffing that is anti-dust-mite, anti-microbial, flame retardant and very springy. You can spot wash this little guy to keep him in tip-top shape. This is a different sort of Easter bunny, perfect for teething babies. This handmade teething toy/rattle will be your baby’s favorite Easter gift and will help him develop his senses of touch and hearing, as well as hone his fine motor skills. The bunny can even be used as a musical instrument for older kids. Each rattle is hand-crocheted from 100% cotton and includes a big bell in one end of it. The bunnies are filled with 100% natural sheep’s wool and have safe, hand-embroidered faces. Rattles are safe for babies ages 3 months and up. Bunnies are available in many different colors and can be washed by hand with mild soap. 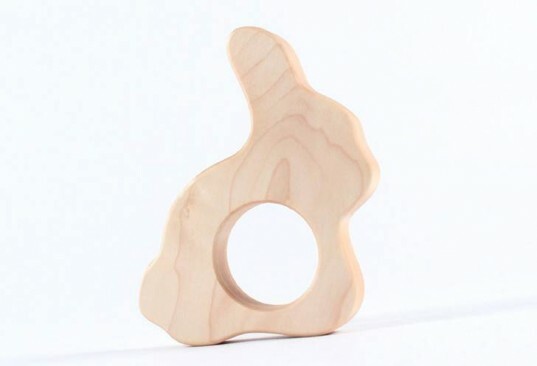 This baby bunny rabbit teether is perfect if you’re looking for a fabric-free baby Easter gift. Handcrafted from non-splintering hardwood, hand sanded to silky smoothness and left unfinished — it’s safe, smooth, and super cute. This teether is completely non-toxic, and it will never wear out. This company further donates to the Peace Corps worldwide youth development projects for every toy sold and uses recycled packaging materials, natural cotton bags, and other earth-friendly materials. Each teether comes in a reusable, natural cotton bag that is made in the USA. 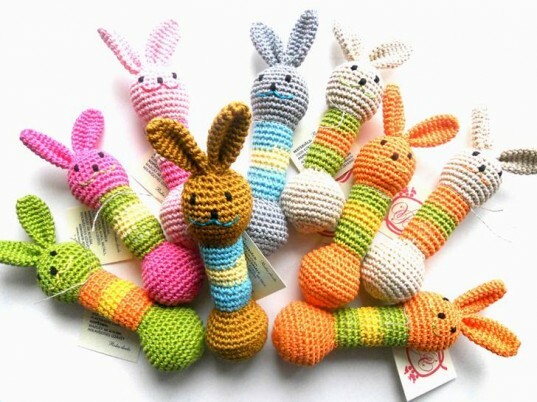 These little peg bunnies are sure to brighten every Easter basket. Each little wooden bunny is hand painted in a bright color with child safe, non toxic, water based paints. The bunnies have posable, eco-friendly felt ears and a fuzzy white tail (optional) and even fit nicely inside larger plastic Easter eggs. The ears are glued and wired in for strength and though it comes with 3 feet of hemp twine attached for wear or display, you should remove the string if you’re giving one of these to a child. Also, because these are small and more delicate, they’re best for kids who are past the rip-it-up toddler stage. This cute bunny is custom knit for your child in the colors and clothes of your choice. Heirloom quality, this bunny is made from a wonderful soft wool yarn and stands about 14" (36cm) tall, to the tips of their big bunny ears. They have a sweet little tail, and are stuffed with wool stuffing. Bunny faces are safely and simply embroidered with wool. You can choose for your bunny to be wearing overalls or a dress, sweater, or other clothes. You can keep this bunny toy clean in the sink -- just swish with a little gentle soap, rinse well, squeeze out excess water, and air dry. Woolies also has a great Soft Bunny Rabbit Doll for babies. We love Fairyfolk creations for their unique sweetness and quality, and this little bunny on her spring nest is no exception. This Waldorf inspired rabbit has two big bunny ears, a little pink nose and a fluffy little tail. She's needle felted with 100% wool and her vine made nest is lined with comfy soft mossy wool. This play set will bring hours of fun to your child's world at Easter, and year-round. This beautiful organic rabbit stuffed animal toy is basic but lovely and is from one of our favorite Etsy shops to boot. The perfect little plush stuffie for your modern kiddo. This organic rabbit measures 5"/13cm long from nose to tail and is handcrafted with soft 100% organic creamy white cotton fleece then stuffed with pure wool stuffing that is anti-dust-mite, anti-microbial, flame retardant and very springy. You can spot wash this little guy to keep him in tip-top shape. This is a different sort of Easter bunny, perfect for teething babies. This handmade teething toy/rattle will be your baby's favorite Easter gift and will help him develop his senses of touch and hearing and hone his fine motor skills. The bunny can even be used as a musical instrument for older kids. Each rattle is hand-crocheted from 100% cotton and includes a big bell in one end of it. The bunnies are filled with 100% natural sheep's wool and have safe, hand-embroidered faces. Rattles are safe for babies ages 3 months and up. Bunnies are available in many different colors and can be washed by hand with mild soap. This baby bunny rabbit teether is perfect if you're looking for a fabric-free baby Easter gift. Handcrafted from non-splintering hardwood, hand sanded to silky smoothness and left unfinished -- it's safe, smooth, and super cute. This teether is completely non-toxic , and it will never wear out. This company also donates to the Peace Corps worldwide youth development projects for every toy sold and uses recycled packaging materials, natural cotton bags, and other earth-friendly materials. Each teether comes in a reusable, natural cotton bag that is made in the USA. 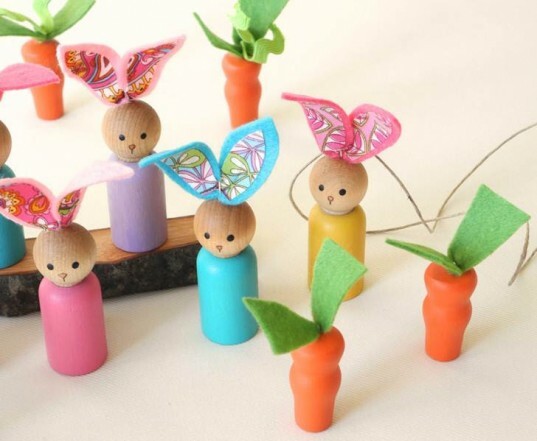 These little peg bunnies are sure to brighten every Easter basket. Each little wooden bunny is hand painted in a bright color with child safe, non- toxic, water-based paints. The bunnies have posable, eco-friendly felt ears and a fuzzy white tail (optional) and even fit nicely inside larger plastic Easter eggs. The ears are glued and wired in for strength and though it comes with 3 feet of hemp twine attached for wear or display, you should remove the string if you're giving one of these to a child. Also, because these are small and more delicate, they're best for kids who are past the rip-it-up toddler stage.